I use a novel dataset of prices and wages from the French colony of Quebec (Canada’s second largest province today) to measure colonial-era living standards. Following Allen’s (Explor Econ Hist 38(4):411–447, 2001; The British industrial revolution in global perspective, Cambridge University, Cambridge, 2009; Econ Hist Rev 68(1):1–22, 2015) welfare-ratios approach, I find that Quebec was poorer than the American colonies and London, but somewhat richer than Paris and Southern England. The Quebec–Paris comparison is sensitive to changes in the basket used to compare wages. Shifting from a bare bones basket to a respectable basket, Quebec loses its advantage over Paris, but remains poorer than the American colonies and London. The authors wishes to acknowledge the help of Alexandra Foucher, Stephen Broadberry, Chris Minns, Alexandre Padilla, Gloria Main, Vadim Kufenko, Judy Stephenson, Peter Sims, Jeffrey Williamson and Peter Lindert. Special acknowledgments go to Gilles Paquet and Peter Gagné. Professor Paquet helped me navigate the sources thanks to his pioneering work in Quebec's economic history and who also provided numerous comments early on. Mr. Gagné, the archivist of the Séminaire de Québec and the Musée de la Civilisation de Québec, helped me understand the sources I was using and gave me the necessary materials to assess the strengths and weaknesses of the data. Finally, I thank Claude Diebolt and the anonymous referees who provided insightful comments prior to publication. All errors remain my own. The units of measurement used to measure goods changed in some years for some goods. Rousseau (1983) provided equivalences in his work on the Augustines congregation that ran a hospital in Quebec City. Most researchers rely on Rousseau and simply quote him. These figures are illustrated in Table 4. One should be very careful not to confuse the French livre and the English pound. Although the two are generally considered linguistic equivalents (livre in French means pound in English), they represent different weights in grams. The French livre (translation for pound) carries 489.5 g against 453.6 g for the English pound, a 7.91% difference. In the course of my research, I have seen historians derive conclusions without making this important correction. The conversion of grain volume units to weights was based on a minot of wheat or peas weighing 60 livres, while a minot of oats weighed 34 livres. The monetary system of Canada was the monnoye du Canada. Its main unit was the livre, which could be subdivided in twenty sols, which could in turn be further subdivided in twelve deniers. The prices used in this paper are retail prices. This is made clear by Ouellet et al. (1982: 89–90) who collected prices for a few agricultural goods from these account books between 1760 and 1850. The retail nature of the price quotations is clearest when we compare those from Paquet and Wallot (1967) with those from Ouellet (1972) and Ouellet et al. (1982). Paquet and Wallot relied on the price quotations from the urban produce markets reported in newspapers. These prices are systematically lower than those provided by Ouellet. This is unsurprising given that the price quotations from the urban produce markets are generally considered to be wholesale prices (Ouellet et al. 1982: 89; Brouillette 1991; Bergeron 1992). This supports the contention that the account books of the congregations provide price quotations that can be qualified as retail prices. Can the account books of the two congregations be mixed? In his work, Fernand Ouellet uses the two and he seems to believe that they can be mixed (1966: XXI). However, he never compared the two series for readers to assess. In Fig. 4, I compare the price of wheat as reported by each of the two congregations in order to assess comparability. As can be seen, the two series evolve in lockstep at the same level thus confirming that they can be mixed. Unfortunately, it was impossible to reliably convert the prices into silver units. There is some existing series for silver prices between 1693 and 1749 (Desloges 1991), but the series has gaps, does not extend to 1775 and also differs modestly from the official conversion rates. This made me reluctant to provide the conversion especially given that this step was not required in order to generate the ratios as it would have been only helpful to compare nominal prices and wages. Below are notes regarding each good and the way they were treated to insure quality. The years covered are also identified. In Table 7 at the end of the “Appendix,” readers are provided with the individual prices. Wheat The predominant crop of New France, its inclusion was crucial given that the literature gives it roughly three-fourths of the land sown in the colony. Coverage All years were accounted for. Firewood An obviously important item in the cold weather of Canada, it required particularly careful handling for the purposes of this research. First of all, it was reported as a corde of the French metrological system, which is not the same as a cord in the British metrological system. Secondly, the Séminaire and the Ursulines often had to pay for the wood plus the cost of transport. Reported as charroy or charrier, it needs to be retracted from the total price, as this would reflect the urban price premium. Peasants who owned their own farms and simply chopped firewood in order to heat their households, while clearing land in the hinterland would not pay that premium. They would, however, forego its sale to urban dwellers. Coverage The missing year is 1760. Wine Price quotations rarely made a distinction between red and white wine. A “pot de vin” was often all that was mentioned. When this was specified, the price was often the same for both products. As a result, I concluded they were interchangeable without any loss of informational quality. Forays into the data past 1790 show that this is not the case after that point, as the British begin importing vin de port (port wine) and vin de ténériffe (Spanish wines). Coverage The missing year is 1758. Spirits The prices I collected were for eau de vie which is a more expensive alcohol than rum (Ferland 2010: 95). I took the relative price of eau de vie to the price of guildive reported in Ferland (2005: 95) between 1733 and 1754. The ratio was 0.463. Coverage The missing years were 1745, 1754, 1758, 1759 and 1769. Oats This crop was significant in the colony and was often used as feed for livestock. It was either the second or third largest crops (in competition with peas) after wheat. Peas Second only to wheat, peas were used to feed both farm households and livestock. Coverage The missing years are 1705, 1728, 1741, 1746, 1752. 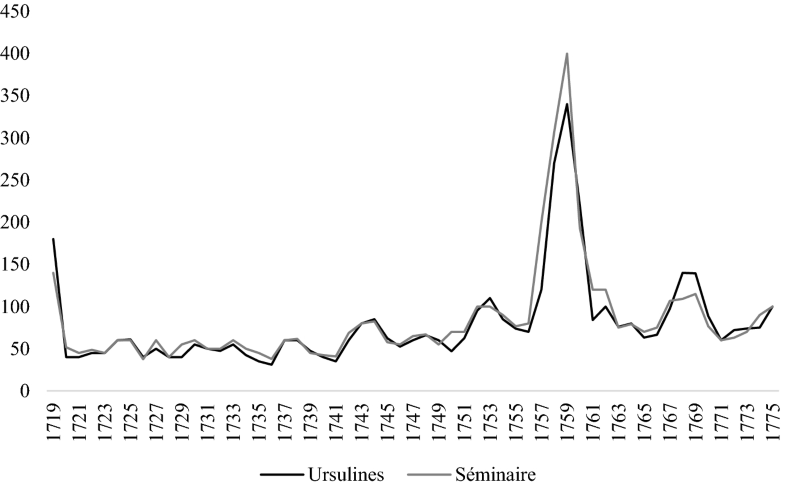 Burning oil Generally imported, but not always (it could be substituted by oils from sea products produced in the colony in particularly dire times), burning oil was a major consumption item in New France. Coverage The missing years are 1688, 1689, 1745, 1755, 1759, 1760, 1765, 1769 and 1775. Butter Dairy products have been a generally important item in the agriculture of Quebec. Ill-suited for crop growing, Quebec is very well suited for herding animals. As a result, butter was an important good. Coverage The only missing year is 1760. Eggs Egg prices were very well recorded in the archives of the Séminaire up to 1725, after which they were less frequently mentioned. When they were, it was to say “this amount was spent on eggs” with no specification for quantities. However, the Ursulines reported dozens of transactions involving eggs every year from 1716 (the start date of their account books) to 1760. From 1716 to 1725, both sources showed egg prices behaving identically and being at similar levels. Coverage The missing years are 1696, 1699 and 1700. Beef Beef was sold by the livre, and it was frequently consumed. This is a considerable advantage, as I do not have to rely on the price of animals. This is a retail price. Some prices for veal, pork and sheep were found, but these products were not as frequently consumed as beef. Coverage The only missing year is 1723. Soap Soap was also sold by the livre, but it was used infrequently by the average household, and in small quantities. It was one of the items for which the most observations were missing. Coverage The missing years are 1697, 1703, 1704, 1706, 1708, 1715, 1718, 1724, 1726, 1740, 1741, 1744, 1745, 1749, 1750, 1752, 1754, 1755 and 1756. Candles Candles were also sold by the livre, its prices matched closely the price of tallow in terms of evolution. Coverage The missing years are 1701, 1711, 1712, 1717, 1721, 1722, 1724, 1726, 1727, 1729 to 1732, 1735 to 1740, 1742, 1754, 1755, 1757 to 1760, 1769, 1770 and 1773–1775. Cloth (toile) Clothing items were measured by the aune and were imported in numerous kinds: carizé, indienne, mazamet, cotton, soie, mesly, de Russie, du païs, toile, d’herbes, voile, chanvre, azur and molton. Wool, not faithfully reported in many years, was measured in livres. Numerous clothing items were luxuries, whose prices differed massively from other cloth items. Hence, attention was given only to the cheapest kinds of cloth: (1) toile (unspecified type of cloth, which was always far cheaper than others reported in the same transactions. Generally, they were rags); (2) d’herbes; (3) voile (a proxy for rough clothing items); (4) chanvre and; (5) du païs or indienne, which was domestically produced and tended to be very coarse. These types of cloth were the ones generally consumed by the population as a whole. The others are of great quality and would have been used by aristocrats, merchants and rich artisans. Coverage The missing years are 1729, 1739, 1740, 1741, 1743, 1746, 1749, 1755, 1756, 1757 and 1764. The different types of work were récoltes (harvesting), foins (feeding livestock or working in the fields), étable (working at the stable), fauchage (mowing), à la ferme (at the farm), aux clôtures (enclosing), défrichages (land clearing), aux fossés (ditch digging) and au vacher (cowherding). The non-agricultural unskilled work was for entreprise de bois or bûcher du bois (chopping or sawing wood) and pour peinturer (for painting). These two tasks had wages identical to those in agriculture when they were reported. The only difference for the unskilled was for ouvriers (workmen) generally on very heavy manual work like building roads. Bairoch (1989) pointed out that when workmen were hired for heavy manual work (like ouvriers), they generally earned a premium which may bias the data. However, in this case the issue is limited. Only three observations were related to ouvriers, and their wages were not out of line with those of other unskilled workers. The same was true of workers engaged in reaping (which can be said to be part of the récoltes category) who could also have earned a premium. However, when récoltes wages were reported alongside other tasks, there were no signs of a premium. As a result, I kept both the ouvriers and récoltes inside the sample. The wage rates are also very clear about the type of compensation. When workers received in-kind payments, the account books added the notice of “et nourry” (and fed) to the wage rate or mentioned a specific item that was offered. In those instances, the Séminaire also reported the value of the payments-in-kind in total compensation. However, payment-in-kind was infrequent. While this may appear surprising, it is important to consider that workers offered work on the labor market for the purposes of acquiring specie useful to the acquisition of imported and manufactured goods that they could not produce on their farm. Many sources report that occasional workers often insisted on specie payment. In addition, figures proposed by Bessière (2007: 253) are quite telling: for a sample of 1299 annual and monthly wage contracts between 1640 and 1710, 51% were stipulated exclusively in terms of payment in specie, while an additional 25% stipulated payment in a mixture of services and in-kind compensation in addition to payment in specie. Long-term employment contracts imply some wage rigidity and workers who sign such contracts can be expected to prefer a larger share of their compensation to be in-kind than daily workers (who can renegotiate wage rates more often) would. As such, the proportions found by Bessières appear in line with the finding that daily wage rates rarely included in-kind payments. However, there are downsides to the data. When wages were reported, they did not always include the months in which they were contracted.45 This affects largely skilled workers like masons, carpenters and millers who did work year-round. The vast majority of the observations that specified winter work affected skilled workers—which are not used in the present paper. I prefer to relegate them to future work. Fortunately, the unskilled jobs from which wages were taken relate to tasks that would have occurred during the growing season, roughly from April to November, and to workers operating on a piecemeal basis. Moreover, the few observations that had the mention en hiver (during the winter) either did not provide enough information to be included in the calculations or reported wages in line with other rates observed for the year. Figure 5 illustrates the distribution of the observation and Table 5 illustrates the years. In Table 7 at the end of the “Appendix,” readers are provided with the individual wages. All the available annual values were averaged and the missing years were interpolated using a nearest neighborhood method. 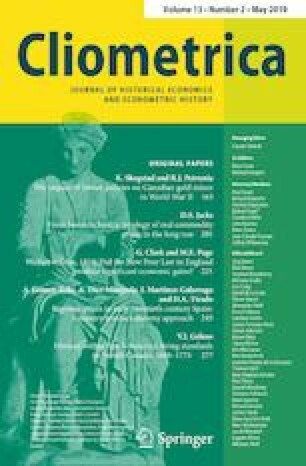 Finally, a longer discussion of Quebec’s labor market before 1760 can be found in my doctoral dissertation Geloso (2016: 67–76)47 and it provides further details which would needlessly lengthen this paper if included here. However, one of the key elements discussed in the dissertation is that the areas from which wages were collected had similar levels of improved lands (they were settled roughly at the same moment) and were all in proximity to an urban market which would have provided occasional employment. There is a need to confirm the rural nature of the prices and wages reported in the account books. In order to provide such a confirmation, I collected prices from government reports (see Table 6) that concerned acquisitions for defense-related projects in the cities. The bordereaux (expense accounts) (found the years between 1742 and 1745) clearly specified the urban nature of the prices and wages reported by stating the purpose of the expenditures (construction, maintenance, provisions). If the prices and wages I collected from the religious congregations are rural, three things should be observed. The first is that items produced in the countryside (wheat, peas, meat and firewood) should be cheaper there than in the cities. As the farmers around the cities had to get these goods transported to the cities, one should expect a price premium. The second is that imported goods be more expensive in the countryside. This is because these goods had to enter through the port cities and then be sold in the countryside by merchants. As such, a price premium should be expected in the countryside. Finally, cities have a well-documented tendency to have higher nominal wages than the countryside. Domestically produced goods like grains, butter and meats were dearer in the city than in the countryside. Imported goods (with the notable exception of wine) cost more in the countryside than in the city. Wages were also lower in the countryside than in the city. In fact, it was not only the mean wage rate that was lower in rural areas, but the range of wage rates also tended to be higher in the city. As such, all three expectations are met. Not only that, but the price differences match the land transport costs discussed at length by Dechêne (1994: 195). As such, I feel reassured that the dataset I assembled relates to rural areas. These sources also provide a chance to assess the comparability of wages in the Quebec area with those in the Montreal area. As can be seen from the column regarding urban wages in Montreal, wages in Quebec City were higher than in Montreal in 1745 and lower in 1742 and 1744. However, prices were also moderately higher in Montreal (not shown in Table 6). In 1742, and 1745 wheat prices in Montreal were 10% above those of Quebec City, while they were 3% lower in 1744. The same is true for beef prices which were lower in Quebec City than in Montreal by 7% and 5% in 1742 and 1745, respectively, while they were higher in Quebec City than in Montreal by 3% in 1744. A similar price differential appears for goods such as wine, spirits, salt, firewood48 and cloth. For imported goods, this is not surprising as they would have had to enter in Quebec City and then incur additional transport costs to arrive in Montreal.49 As such, differences in real wages appear to be minimal. Moreover, it is worth pointing out that 52.3% of the population of the colony lived in the district of Quebec as opposed to 39.8% in the district of Montreal in 1739 (Public Archives of Canada 1874: 60), which suggests that the concentration of observations in the Quebec area may be more representative of the majority of the population. One important justification and three key modifications had to be made to the Allen consumption bundles to reflect Canadian realities: the use of oats in the bare bones basket, the computation of alcohol consumption, the level of meat consumption and the level of fuel requirements. The “subsistence” crop used was oats. French Canadians rarely ate oats themselves, reserving them instead for their animals, and preferred wheat (Desloges 1991: 143; Altman 1988: 698). However, oats were the crop of choice in hard times50 and it was the cheapest way to acquire calories. One bushel of oats provided only 62% of the calories of a bushel of wheat (Dessureault 2005: 265). This lower caloric content was more than compensated for by the differential in yields per unit of land. According to Marvin McInnis (1981: 227), who used mid-nineteenth-century data, one acre could yield either 9.2 bushels of wheat or 18.6 bushels of oats. Adjusting for seed set-asides, one acre of oats yielded 31% more calories than one acre of wheat.51 The price data employed in this paper suggest that, on average from 1688 to 1775, one thousand calories from oats could be acquired at 64% of the price of one thousand calories from wheat. Given all these proportions, it is easy to see why oats should be the subsistence crop to be used in the bare bones basket. French Canadians tended to import large quantities of alcohol. The problem is that picking one type of alcohol is difficult as consumption products were diversified and we cannot assume that they drank only wine, spirits or beer. Ferland’s (2010: 74–75) data on alcohol imports suggest that the annual average consumption of wine per person between 1699 and 1754 stood at 14.4 L and that it was rising throughout the period. For the few years she has spirits (eau de vie) and rum (guildive, tafia) consumption, per capita consumption stood at 0.6 and 14.3 L per year, respectively. We must also consider home-made distillation of spirits from grains produced in Canada, as well as ciders, beers and bière d’épinette (made from the foliage of white spruces boiled in water with molasses or maple syrup) (Ferland 2010: 37–66). These are substantial quantities of alcohol representing close to 12% of income per capita as measured by Altman (1988: 702).52 The basket computed by Allen implies a per capita consumption of wine equal to 51.375 L per year.53 When I convert the imports of spirits into wine on the basis of the relative calorie content of each, I arrive at a wine-equivalent consumption of 54 L per year. Given that unknown but probably considerable quantities of grain-based beers54 and bière d’épinette must be added, the level of alcohol consumption seems in line with the respectable basket but it is obvious that we cannot only choose one alcohol. As such, I opted to create allotments of 17.9 L for wine and 20 L for spirits (to include imports and domestic alcohols). The quantity of meat in the respectable basket (26 kg) is inappropriately low for Canada. Generally above subsistence levels, the inhabitants did enjoy larger quantities of meat. Between 1713 and 1739, which were peaceful years, the average colonist consumed 42.5 kg of meat.55 This is in line with Lewis and McInnis (1984: 56, 76–77) who found a production of 55 kg per person in Quebec in 1851. While these proportions are greater than in Allen’s basket, they are in line with those for Latin America where meat was inexpensive (especially relative to European countries) and constituted a sizable share of local diets (Abad et al. 2012: 152). For Canada, I opted for a quantity of 42.5 kg at the respectable level and I attribute a consumption of 10.4 kg of butter because I do not possess information about cheese.56 Differences in calories were subtracted on proportional basis from the other grains contained in the basket. The last substantive modification relates to the role of fuel. Normally, the bare bones basket assumes 2 million BTUs (MBTUs), while the respectable basket assumes 5 MBTUs—which is woefully insufficient given Canada’s harsh winters. Consumption figures are well above those levels: the household of an eighteenth-century priest is estimated to have required 25 cords of wood per year (Mousette 1983: 35), while that of a widow was equivalent to 20 cords of firewood (Ibid: 37). In his work, Greer (1985: 35) reports that a farm household in St-Ours (southeast of Montreal) consumed 25 cords of firewood in 1791. This suggest that households tended to consume somewhere between 20 and 25 cords which, given the modal household size of six individuals per household, is somewhere 3.33 and 4.17 cords per person.57 The type of firewood is very rarely reported and, as testified by the work of Sweeny et al. (1988), all types of wood were used: maple, birch, oak, pine and beech. Thus, there is no way to assess the actual consumption in terms of BTUs. The only solution is to derive a range with pine (at 14.8 MBTUs per cord of 128 cubic feet) as the lower bound and oak (at 24.2 MBTUs per cord of 128 cubic feet) as the higher bound.58 An annual household consumption of 20 cords was equal to somewhere between 18.48 MBTUs to 30.22 MBTUs per capita (assuming 6 persons household) per year and a consumption of 25 cords represented between 23.15 MBTUs and 37.84 MBTUs. These numbers are in line with numbers for the American colonies in the North, colonial households in Boston having required 30 cords of firewood per year in terms of consumption (Gordon 2005: 25), while students at Princeton and Harvard in the early nineteenth century were allotted 3 cords of firewood each (Cole 1970: 340). Fuel requirements in North America were much more considerable than in the Old World and I opted for a bare bones basket containing 20 MBTUs and a respectable basket containing 30 MBTUs. I feel that anything below those levels would have threatened survival. In Table 7 at the end of the “Appendix,” readers are provided with the individual values of the respectable and bare bones basket (in livres). I also provide in Table 7 the values of the different baskets had I computed them following the basic Allen requirements at both the respectable (5 MBTU, 68.25 L of wine, 26 kg of meat and Allen quantities for all other food items) and the bare bones level (2 MBTU, 5 kg of meat and Allen quantities for all other food items). I used the same source as Allen et al. (2012a, b) (namely Main 1994) for the entire period. However, the wage rates for New England are different than those in the Allen et al. (2012a, b) file. The wage rates they used were taken from Main (1994), but they are systematically lower than hers (by roughly 20%) or those of other scholars (Vickers 1994: 248). The explanation for the difference appears to be an incorrect conversion in monetary units. Gloria Main quoted the wage rates per day in pences sterling rather than pences of the colonial currency (1994: notes on p. 46, notes in p. 48 and Table III). The two systems yield different silver equivalents. Converting Main’s data using sterling exchange rates into silver yields wages 20% above those of Allen et al. in their datasheets. However, when the colonial exchange rates are used, we arrive roughly at the values provided by Allen et al. which reinforces the plausibility of the use of the wrong conversion factor. This was confirmed in correspondence with Gloria Main. In the bare bones basket, I also made a modification to the clothing item series. Colonists generally wore mixed garments, whose prices were lower than those suggested. Historian Weedon (1890 : 890) suggested that in 1713, one yard of plain cloth and one yard of checkered shirting both sold at 1.25 shillings. With one yard representing 0.9144 m, the price per meter stood at 1.367 shillings. Using the exchange rate of 3.7127 g of silver per shilling (Lindert and Williamson 2016), this means a price of 5.08 g per meter which was indexed to the price movements of linen in England using Clark (2005). For the prices needed for the respectable basket, I used the same assumptions and interpolation methods as Allen et al. (2012b) where possible (candles, lamp oil, beans, butter and soap). For wheat prices, I used Weedon (1890 ) and Cole (1938). Weedon (1890 ) also provided rum prices. I assumed a constant cost of 6.12 g of silver for 52 eggs. In Table 7, I provided the raw data used in this article. The prices of individual goods are provided as well as wage rates, the costs of the different bundles and the resulting welfare ratios.